This Quick Math Game Puzzle is dedicated to Bus Drivers as they have to quickly do lot of calculation during their bus trip. In this Math Puzzle, you need to calculate quickly the value of the given arithmetic equation. You don't need to be expert to solve this quick math Game puzzle, but you will require the basic knowledge of Mathematics to solve this quick puzzle correctly. Lets see if you can solve it correctly in your first attempt? Can you quickly solve this Math Puzzle? 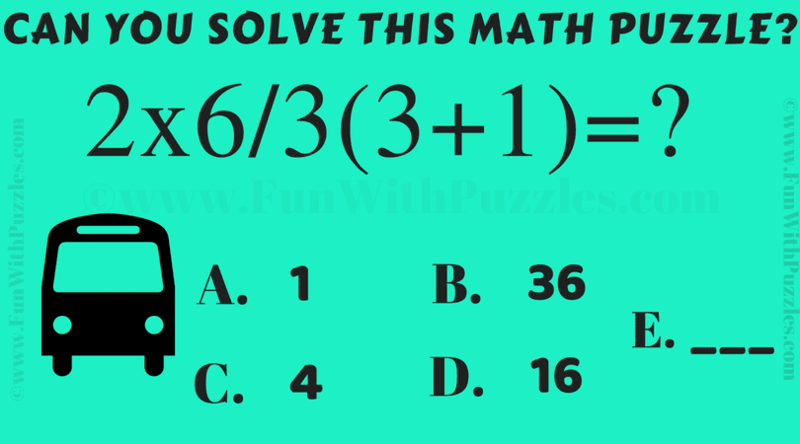 Answer of this "Bus Drivers Math Game Puzzle", can be viewed by clicking on button. Please do give your best try before looking at the answer. The Answer is D i.e 16.